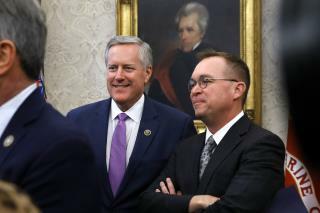 (Newser) – If you've ever called your boss a "terrible human being," it turns out you sort of have something in common with the president's next acting chief of staff. Mick Mulvaney, who was named as John Kelly's replacement on Friday, used those choice words in reference to Donald Trump one week before the 2016 election. Politico reports Mulvaney was up for re-election in the House (he won), and referred to Trump and Hillary Clinton during a South Carolina debate as "perhaps two of the most flawed human beings running for president in the history of the country" when asked whether he was throwing his support behind the GOP candidate. i hope mick isn't going to pretend to change his mind. The Chief Of Staff working the shaft, before he gets it..